It’s been way too long since we did a Fritos Friday, don’t you think? 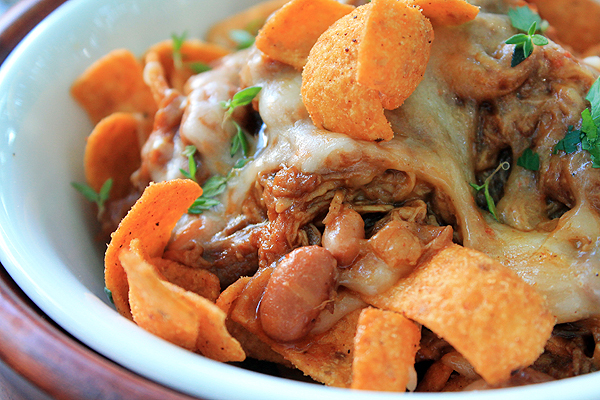 I can’t imagine a better way to celebrate things slowly getting back to normal around here than a mound of Barbecue Fritos covered with pulled pork, chili beans, cheddar cheese, and a little parsley to brighten things up. Hurricane Sandy may have taken a lot of things from a lot of people, but one thing you can be sure of: serving and sharing good food is one great way to bring people together. There are so many stories coming out of the abysmal aftermath; stories of neighbor helping neighbor, stories of whole families feeding as many people as they can, without the help or organization of bigger entities like the Red Cross. Of course, the Red Cross, Salvation Army, and others have their place, and they warrant great esteem. But for me, the stories of individuals taking initiative all on their own to help others is even more inspiring. It’s not just isolated to the local folks though. Barb and Jenn started a Food Blogger initiative to raise money across the world, and the response has been amazing. This little pocket of the Northeast thanks you for your valiant efforts, ladies! 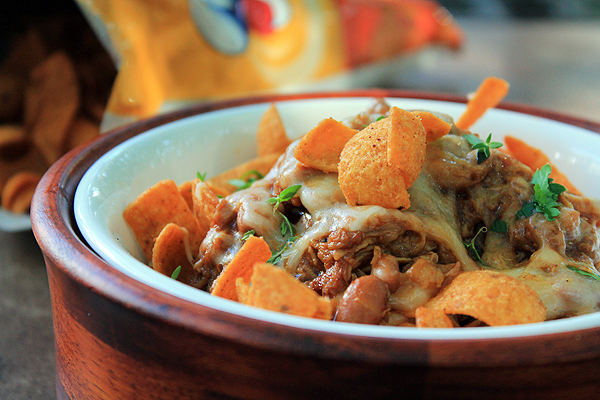 Where I come from, Frito Pie is comfort food extraordinaire. We eat it at football games, under Friday Night Lights. Usually it’s made with chili. 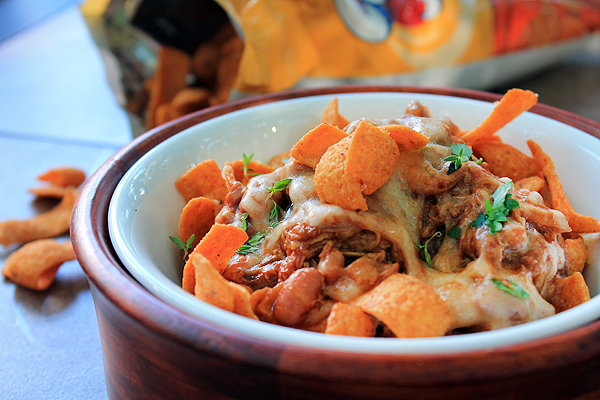 The idea for this Frito Pie actually came from my pal Mary Jane over at King Arthur Flour. We got to emailing one day, and Mary Jane was kind enough to share her husband’s famous barbecue sauce recipe, and mentioned that they had recently had pulled pork Frito Pie. How could I not recreate this at home?! We made this after making Pulled Pork Nachos the night before, using the leftover pulled pork from those. I simply added a can of Ranch Style Beans and we were good to go. Enjoy Mary Jane’s family recipe for Barbecue Sauce, and have Pulled Pork Frito Pie for dinner tonight! 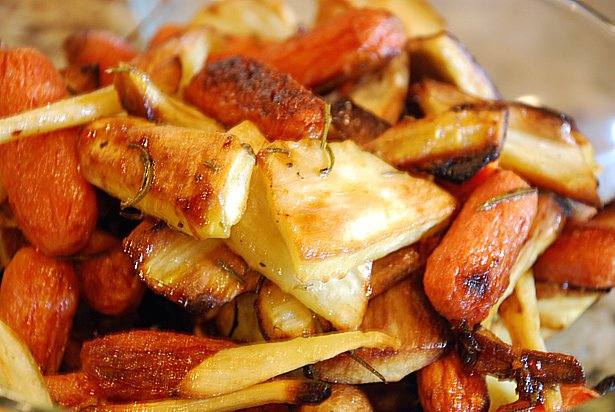 Place all ingredients in a slow cooker. Whisk together until well combined. Simmer on low for three hours. Stir it every so often, as the high sugar content will cause it to burn if you don’t. Heavily coat the pork shoulder with kosher salt and black pepper. Slice a large Vidalia onion into slices, and mince three cloves of garlic. Set aside. Remove barbecue sauce from the slow cooker and measure out 2 1/2 cups. Store the rest in the refrigerator for later use. Place the pork shoulder in the slow cooker, then cover it with onion slices and garlic. Pour the barbecue sauce over all the ingredients. Cook on high for 3-4 hours, then remove the pork and place it in the bowl of a stand mixer. Use the paddle attachment to mix on high, instantly pulling the pork without burning your fingers! Place the pulled pork back in the barbecue sauce and mix well to coat evenly. Place a few handfuls of Barbecue Fritos in each bowl. Mix pulled pork and chili beans together in a bowl. 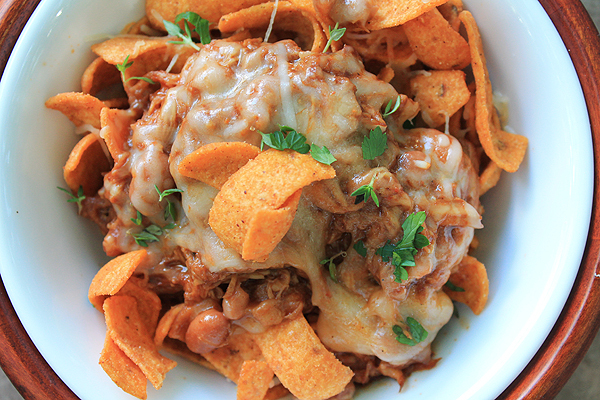 Spoon about 1/2 cup of pulled pork on top of Barbecue Fritos. Cover with shredded Sharp Cheddar cheese. Melt the cheese in the microwave if desired. I have to admit, I haven’t really gotten on the Frito train…until now. This looks freaking amazing, and now I’m going to have to make it! Also, I’m really glad things are getting back to normal, hooray! Tracy, I’m glad I finally convinced you! Wouldn’t you know we just bought a bag of Fritos to go with the veggie chili we’ve been eating all week (it’s not true Texas chili, avert your eyes). If I had a spare pork shoulder around, THIS would be happening. Well, you know, it pays to have a spare pork shoulder around for emergency Frito Pie purposes. All we have is a spare (still-frozen) ham! Thanks, Kathryn. I wish I could send you Fritos. I think they’d be a major guilty pleasure. Yay Frito Friday! My favorite blog series EVER. This looks awesome! My husband would flip if I made it for him. Amanda, welcome home dinner? And thanks – I kinda adore Fritos Friday, so it means the world that you do too. This will be made in my house. Totally. Shelly, I think the boys will go nuts over it! My guy certainly did.